"...What a wretched-looking face. Wash it. Aren't you the wife of the successor to the Ushiromiya family? You mustn't let the servants see you wear such a shameful expression." "Y, yes, Father... My apologies..."
"It seems that at the instant the family headship was passed on, the family has reached a crisis..."
"Y, yes, Father... I wasn't able to support my husband... I am truly, very sorry..."
"Hmph. 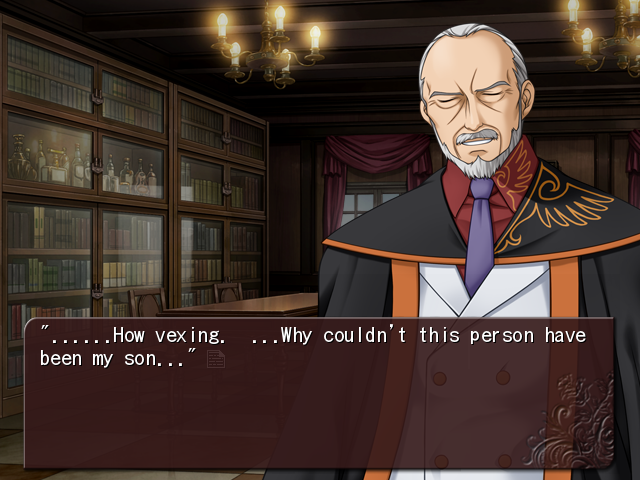 The Ushiromiya family is so very cursed. It was in a terrible state when I succeeded the headship too. That makes your suffering seem almost cute in comparison." At the time, he had been nothing more than a single young man from a branch family, far separated from the Ushiromiya main family. The main family might have had honor and tradition, but Kinzo had had nothing to do with that. Then, the principal members of the main family were wiped out in the Great Kanto Earthquake, along with their businesses. On top of that, there had been a complicated antagonism between the members of the family at the time, and the elders were all trying to impose their will on the others in that sinking ship. 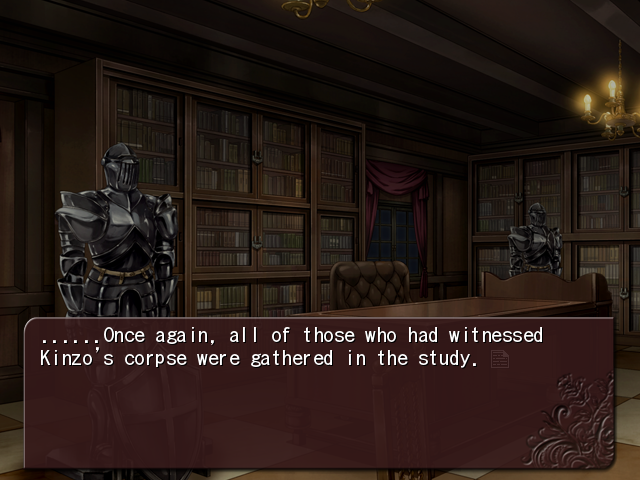 Because of this, they weren't even able to elect a leader to revive the Ushiromiya family. "...Yes. I know a lot about your days of suffering, Father." "And then the war started. At the time, I was already tired of life. I hoped that I would die on the battlefield, but I wasn't sent to the front lines. However, the state of the war grew worse with every day, and the time for the decisive battle on the Japanese mainland seemed to grow ever closer. As bad as it might sound, I hoped that day would come quickly..."
After listening to the approaching footsteps of that god of death day in and day out, it is said that Kinzo started cutting his ties with this world one by one. And then, on that day when he had severed all his regrets, when he reached a state of enlightenment... It is said that he had a mystical experience. "I made a contract with the witch and was given gold and the power of madness. On that day, the old me died, and a new me possessing the insane power of magic was born." "...I know. 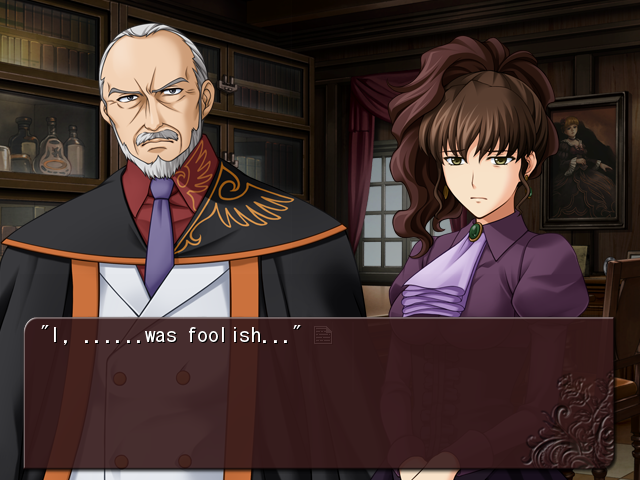 And after the war, you used your ingenious cunning to revive the Ushiromiya family." "...That's right. You returned from the war, conquered the witch Beatrice, and became the head of the Ushiromiya family in the truest sense..."
"Correct. Before I met Beatrice, I was nothing more than a puppet which was only the head in name. I only became the head after conquering the Golden Witch." "...Father... Umm, will this Golden Witch aid my husband Krauss now that he's the new head...?" "Oh, she will. Assuming that he has truly succeeded the headship." "Wh, what do you mean by 'truly succeeded'...?" 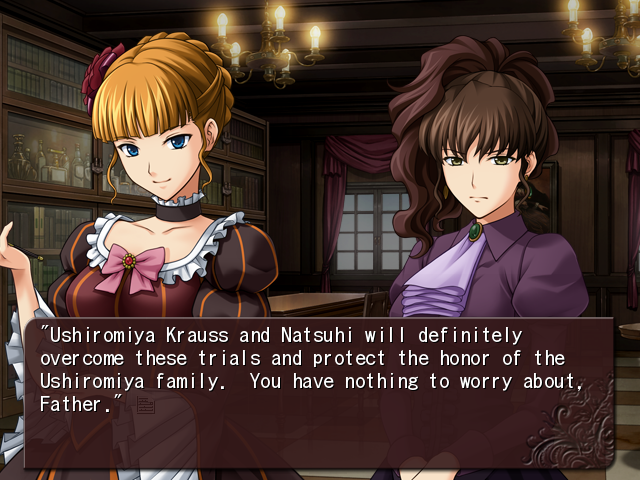 "I mean it depends on whether he bears the responsibility and pride of the Ushiromiya family head in the truest sense. Natsuhi, you should understand this. The headship is not inherited by blood. It is inherited through spirit and conviction. Even though Krauss is my eldest son, he cannot be called the true head if he does not possess these things!" "And, if that spirit were to dwell in a human, even someone other than Krauss, they would make a splendid new head. Beatrice will lend her power to that true head. 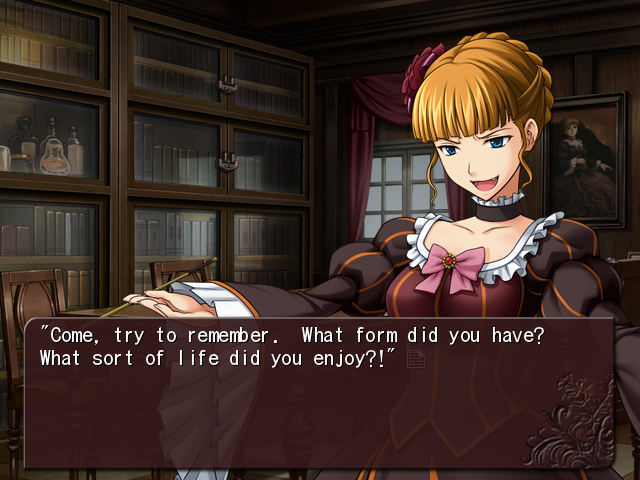 Isn't that right, Beatrice?!!" "And there's only one person in the world who can control her. Me. 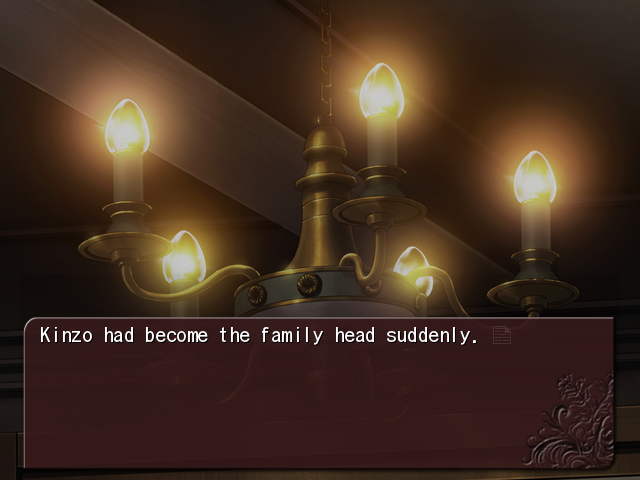 That is why I am qualified to be the Ushiromiya family head." "Hmph. So that pride of yours is what qualifies you to be the head?" "Pride implies self-confidence and bravery. And, it is the embodiment of the insatiable desire to gain a power that can match it. That is why I control you." "...It is quite pleasant to watch men who speak of pride as they turn that desire into reality. The 'quiet man of action' is nothing more than an excuse used by the extremely lucky. A true monarch also speaks of what he doesn't have. And he makes that pride a reality without fail. If one is to control me, they must possess that monarch's pride." "Do you understand, Natsuhi? A true monarch fears no hardship. They declare that they will overcome anything without fail. Even if they haven't yet figured out how. This gives hope to the weak people. They gather, revere the monarch, and swear to assist him. This is where power is gained and his word is carried out. Engrave that into your heart." Natsuhi understood. Through this mystical experience, Kinzo was telling her how to prepare herself to overcome hardship. Even after his own death. 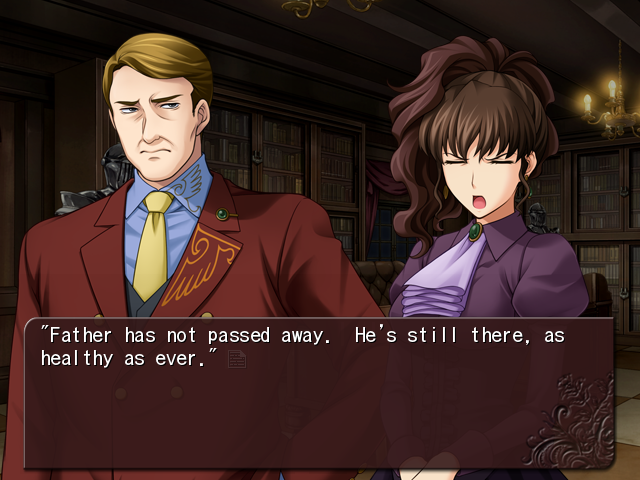 "...Of course there's no time for crying when an Ushiromiya family crisis is upon us. 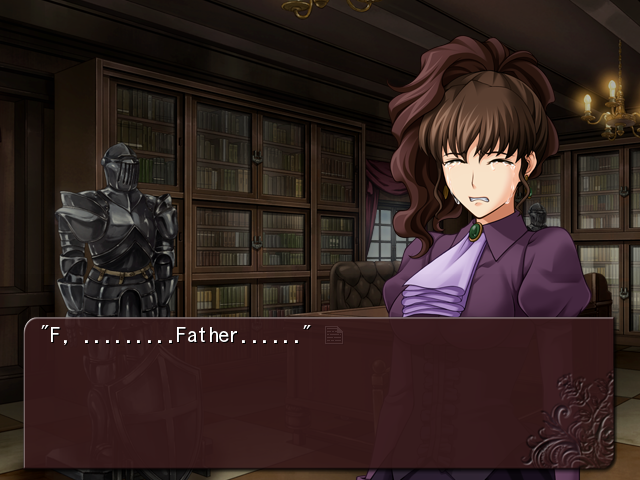 And now that we have inherited the Ushiromiya family from you, Father, we must protect its honor no matter what." "Hoh. Even though you can't even draw a blueprint on how to repay Krauss's debts?" As Beatrice laughed unpleasantly, no, that wasn't it. She was testing Natsuhi, to see whether she possessed the mental readiness to be a true monarch. Natsuhi wasn't confused anymore. She answered clearly, gazing into Beatrice's eyes. "Yes. At this moment, I have not yet discovered the method that we should pursue. 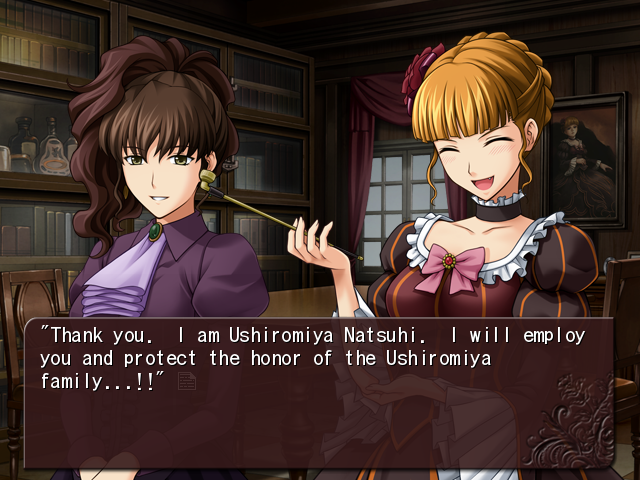 However, my husband is the new head of the Ushiromiya family, and I am his supporting wife. So in my husband's place, I will proclaim it." "...And do you know the scope of Krauss's debt, as well as the horrible state things are in?" "Yes. If the worst happens and we are ordered to leave this mansion tomorrow, we won't be able to refuse. During the distribution of the inheritance, the relatives might even file a criminal complaint." "However, there is no need to worry. We will repay all of the debts before then and restore our honor." "The very fact that a woman with such a disposition married your son is another sign of your great luck." 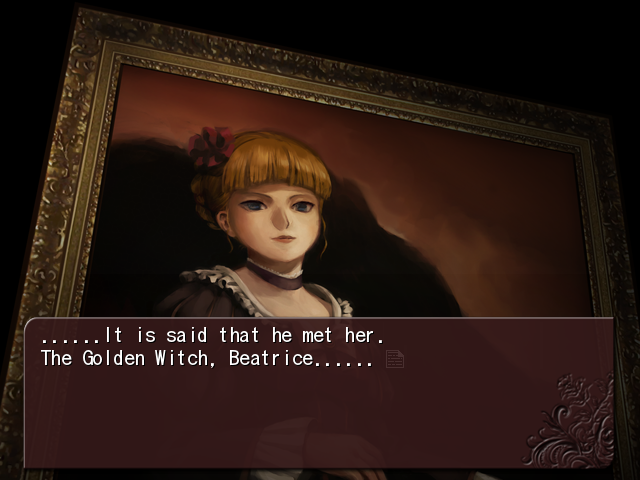 "...Beatrice. This is my final order." "Now that you are no longer the head, I am not obligated to obey your orders." "Hoh. In that case, obey the orders of the new Ushiromiya family head." "You are no longer the head, and Krauss is not yet the head. Whom are you suggesting that I serve?" "I will leave that to you. 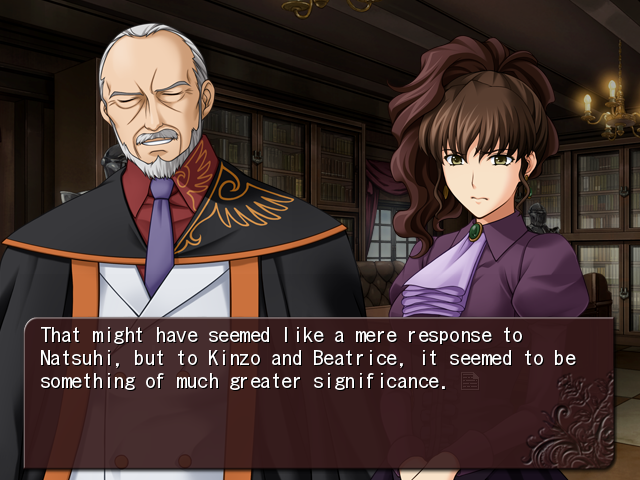 It is up to you to decide who is qualified to succeed the Ushiromiya family head, and who is fitting to bear the mark of the One-winged Eagle. You will ensure this." "I refuse. I won't listen to the orders of a man who isn't the head." "No, this is different. This is a will. The last order that the head left behind for you." "...*cackle*. Then it seems I will have to obey. I can be quite a good friend." "You're only doing this because it caught your interest, aren't you?" "I can't hide anything from you, can I?" "Go and overcome your hardship." 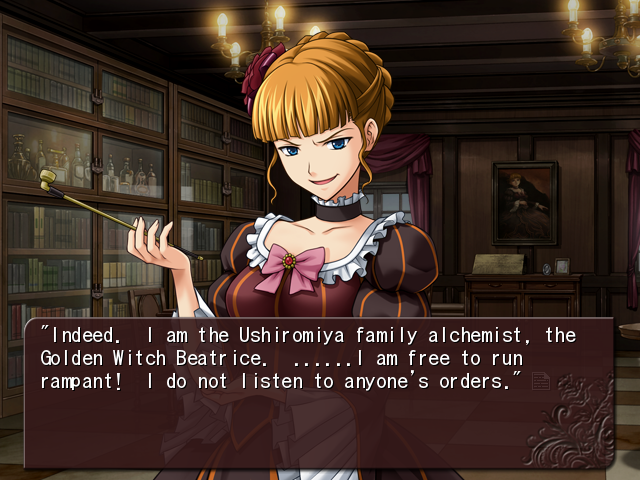 "Ushiromiya family alchemist, the Golden Witch Beatrice, right here. I will give you my aid so that the Ushiromiya family can overcome a crisis once again..."
"...Thank you. I will need your power. We will most certainly overcome these trials." "I will not hold back on my support for your cause, but there is something I must warn you about beforehand. I understand that your troubles now could be solved if I were to bestow a vast quantity of gold again, like I did when I saved Kinzo from his crisis. However, that is something I cannot do." "Sorry, Natsuhi. Beatrice's gold came from a contract limited to my generation. It was agreed that it could only be passed on to another if that person solves the witch's epitaph." "The gold is sealed away by the epitaph. As long as that is not solved, you cannot be given the magic of gold." "...I understand. Then I shall search for another method by which we can save ourselves from this crisis. My husband said that his plan would take time, but he also said that it would definitely be sufficient to repay our debts. If we can buy enough time for that to happen, we will be able to overcome this trial." "But Kinzo is already dead. The doctor and servants are preparing his funeral. You were about to contact the family members. By your own hand, you will bring an end to this ploy for time. *cackle*cackle*, how charming is a guillotine where you lower the blade yourself..."
Startled, Natsuhi looked up at the ceiling. There wasn't actually anything there. But even so, Natsuhi had found something. "So, the magical power has descended." "Natsuhi. Have you made up your mind? What magic of miracles do you desire from me?" Krauss was still impatient and clutching at his head. Genji was as expressionless as ever. Nanjo and Kumasawa wore bewildered expressions on their faces. But in stark contrast to all of them, Natsuhi wore a resolute expression on her face. "Dear, let me ask you one more time. Your plan for raising money is absolutely certain?" "...Y, yes. Give it a year, no, just half a year, and it will certainly bear fruit! But it's just impossible to hope for anything right now..."
"B, but you said it yourself. Father is already dead..."
However, Krauss alone didn't get it right away and asked her. "What... do you mean by that...? Father is already, in reality... right there..."
"I will say it again. Father is still in good health. He is busy with his research, so he'll be even less able to leave his study than usual. Because of this, we must handle all external affairs ourselves so that Father can devote himself to his research without being burdened by meaningless tasks." "In short, nothing will change from the way things have been going. Do you understand, Genji?" "...Yes. The furniture of the One-winged Eagle will continue to serve the Master." "Kumasawa. And you, Doctor Nanjo. Do you understand what I'm saying?" "I, is that truly alright, Natsuhi-san...?" "It may be true that Father passed away today." "But if everyone right here, right now believes, we can use magic to revive Father." "I, it's impossible, Madam... That's just too much...!" 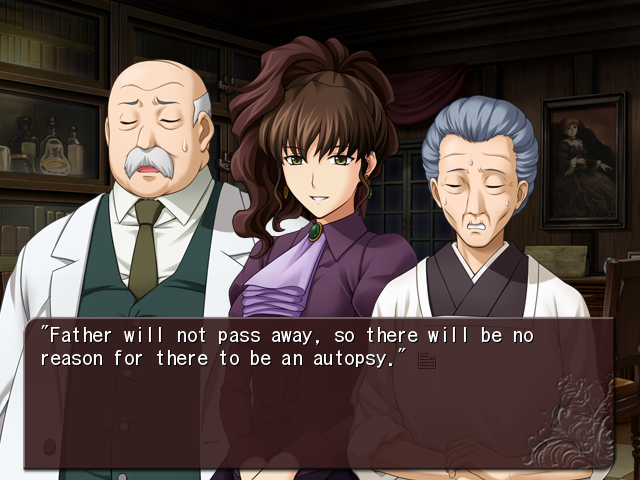 "The time of death will be specified during the autopsy. We can't stop it from looking suspicious...!" 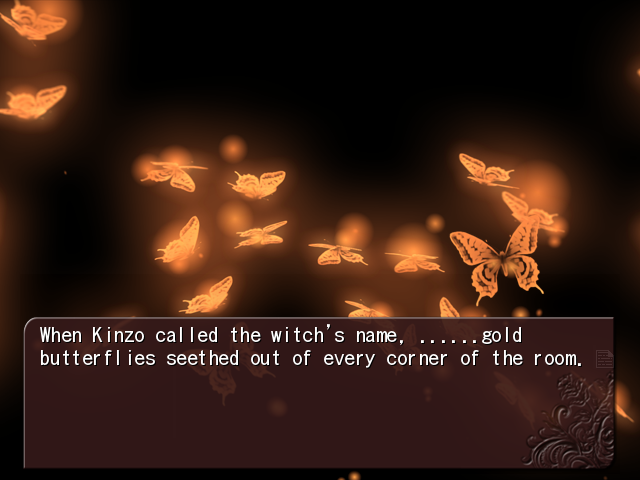 Of course, she wasn't planning to make it seem like Kinzo would live forever. The fake life given to Kinzo would only last until Krauss could repay his debts. After that, Kinzo's soul would finally be able to sleep in peace. 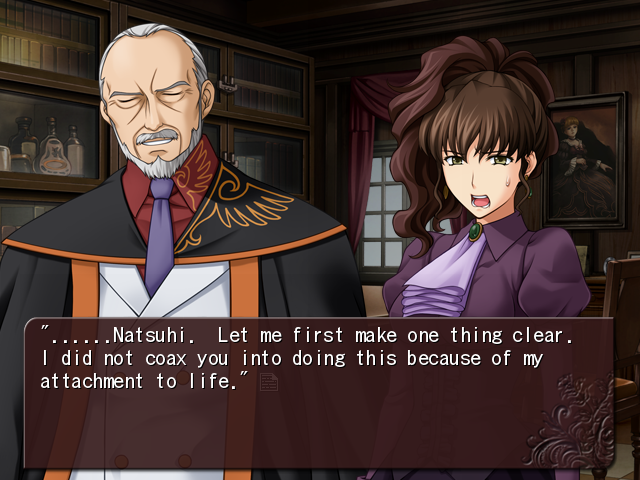 Nanjo repeatedly said that the time of death would be discovered during the autopsy, but Natsuhi kept saying that this wouldn't be a problem. "Father will not pass away by being reported dead." "A, ah, I see. He'll be reported missing...!!" After clapping his hands together, Krauss stood up, shaking his fists. "Yes. Once we've managed to pay back the debt and finish the preparations to lay Father to rest, we will then announce that Father has disappeared." "If he disappears, we can file a report of his death even without a corpse. In other words, we can hide him long enough to have him declared legally dead! What do you think, Doctor Nanjo?! There won't be any problems this way!" "Y, yes, that might work..."
"...Is this really alright, Madam...? If we stay silent, then I'm sure we could keep the Master's death a secret...! However, if we were to slip up even once and let someone find out...!!" "Kumasawa. You're too loud. Father is sleeping right over there, correct? Are you trying to wake him?" It isn't a corpse. Kinzo... is sleeping. As Natsuhi said that, Kinzo lay quietly on the bed as though there was nothing at all odd about her words. "You liar. Don't tell me you didn't anticipate this at least a little. How does it feel, Kinzo? How is your body?" "It isn't bad, but it feels somewhat like being in a dream. I feel light." "A being that wasn't permitted to remain in this world still remains here. You'll have to accept a little discomfort." "...Is your body truly alright?! Is it really, alright...?!" "Hmmm. Actually, it feels quite pleasant. If this is what the world after death feels like, acting like a ghost might not be so bad." "How is this, Natsuhi? Kinzo has revived. That means a funeral is unnecessary. Your hardship has been resolved!" 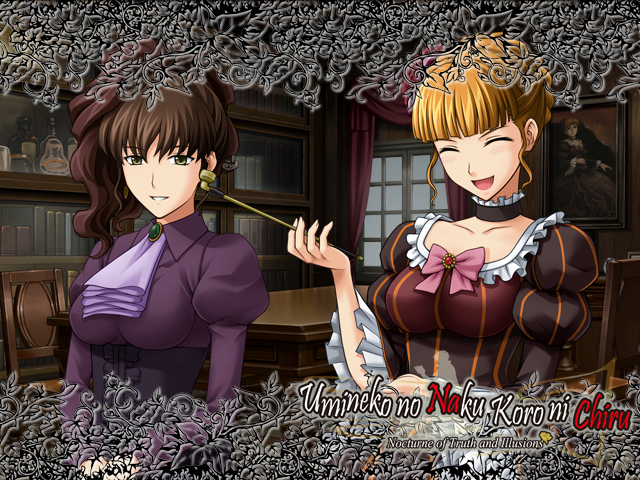 As Natsuhi tried to find words of gratitude amidst her confusion, Beatrice waggled her pointer finger and spoke. "There is no need for thanks. The ruler is allowed to be proud. I will not pay heed to requests, but I will follow orders." "Even so, I'll say it. Thank you. This way, you've bought some time for my husband... We will handle the rest." "Be warned, Natsuhi. 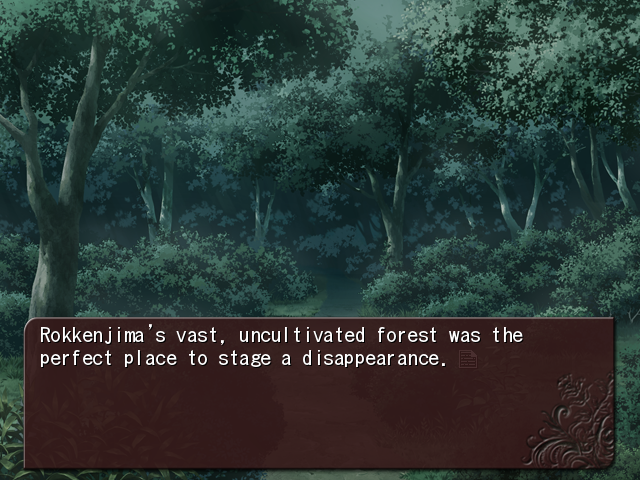 Kinzo may have revived, but that is not an eternal thing. It will only continue as long as my magic does. Be warned that the magic-resisting toxin might destroy the magic. You must understand the laws of magic correctly and work hard to maintain it. I can show you a miracle, but it is your role to grasp it and hold it." "Of course. We definitely won't neglect the miracle you have given us." "Very well. I see, just like floor mats, it seems masters need to be changed every once in a while." "*cackle*cackle*! I like it. I shall serve you."